In most social groups these days you will be labeled “anti-science” if you proclaim to believe in a literal six-day creation. This is because the theory of evolution has been embraced as “fact” by those who reject the authority of the Bible and hold to a secular, humanistic worldview. 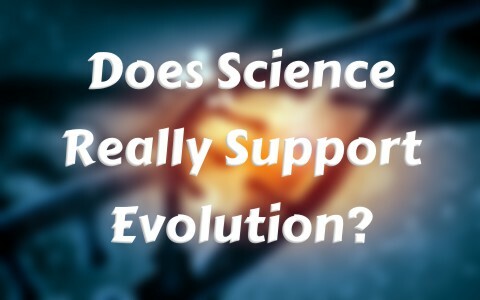 But is it true that science proves evolution and disproves the six-day creation declared in the Bible? In order to claim something as fact, there must be proof to solidify it. Theories, assertions and assumptions do not take the place of proof in the court of law, nor do they among legitimate scientists. While as Christians we believe God’s Word to be fact, and we believe observable science backs up our belief, we recognize that we weren’t there either, so our faith is in God and His Word. We Christians accept our worldview by faith and we assert that those who adhere to the theory of evolution accept their worldview by faith as well. Our faith, however, is in our immutable God, while the faith of the evolutionist is in the ever-changing assumptions of pseudo-scientists. This kind of change within a species is called, “micro-evolution” and Christian “creationists” who hold to the authority and inerrancy of the Bible do not argue that this type of evolution is 100% real and observable, even today. However, this type of evolution has no way of producing a dogcat (half dog, half cat), for instance. That is because new genetic information cannot be added onto the genome of a created kind. This is impossible. It is not observed in nature and it cannot be replicated in a laboratory! This is a significant point! It means that it is impossible for a species of fish (for example) to start growing lungs over time in order to breathe as a land mammal. However, that is exactly what evolutionists believe! This type of evolution is called “macro-evolution.” This is the type of evolution that must exist in order for a race of apes to change into human beings. So, evolutionists do a “bait and switch.” They say because we observe changes within kinds, we know that apes can turn into humans. That is not true at all though. Micro-evolution and macro-evolution are two totally different processes. One (micro) is observable fact. The other (macro) is not observable or replicable and is based entirely on a stack of assumptions and, yes, faith! The theory of evolution, and all other false religions of the world, stem from one primary issue: sin. The Bible says “For all have sinned, and come short of the glory of God” (Romans 3:23). It says that, “the wages of sin is death” (Romans 6:23a). It says, “Except a man be born again, he cannot see the kingdom of God” (John 3:3). So you see, the problem mankind faces is that God is good and we are bad. Most people in the world, including those secular scientists who hold to evolution, refuse to admit to Holy God that they are sinners. That they have a sin problem … a sin debt! As a result of their denial, they set out to establish some other explanation for our existence. The Bible says that their efforts are futile (Psalm 94:11). It says that “every knee shall bow to me [Jesus Christ], and every tongue shall confess to God. So then every one of us shall give account of himself to God” (Romans 14:11-12). There is good news though, for those who are willing to agree with God about their sin and come to His Son, the Lord Jesus Christ for forgiveness of that sin! That good news is that “God so loved the world, that he gave his only begotten Son, that whosoever believeth in him should not perish, but have everlasting life” (John 3:16 ). You see, God became flesh in the person of Jesus of Nazareth. He lived the perfect life that none of us could live, without sin. Then He gave Himself to receive the penalty that we deserved, on a cross. He was physically killed and forsaken by His own Father, for your sake! He died for you! As He hung on that cross, nearing death, He said, “It is finished” (John 19:30). It truly is finished! He took your place. The Just for the unjust (1 Peter 3:18 ). The question that remains is this: Have you trusted in the Lord Jesus Christ for the forgiveness of your sin? Jesus said, “Except a man be born again, he cannot see the kingdom of God” (John 3:3). Have you been born again? If not, go to the Lord Jesus Christ, right now, just as you are. Agree with Him about your sin. Confess it all to Him and receive the free gift of salvation that He secured for you on that cross! “All that the Father giveth me shall come to me; him that cometh to me I will in no wise cast out” (John 6:37 ). Joshua M. Spaulding is pastor of Bible Baptist Mission (http://www.biblebaptistwashington.com/) in Washington, IN, author of, “The Reality of Saving Faith” (http://therealityofsavingfaith.com/), and publisher of EternalAnswers.org (http://www.eternalanswers.org/). You can contact him personally via email at contact@eternalanswers.org. Read more about this subject: How Do Christians Explain Evolution? Nicely done pastor. I so agree. Will we trust science or will we trust in Christ? Many are blinded by science and the god of this world. May God open their eyes and open their ears so that they see and hear the truth found only in Jesus Christ. Well said Pastor Spalding! Unless we humans realize that we have a problem(sin) with a Holy God, there is no need for a Savior from the death that results from our sin(Rom 3:23, 6:23). You outlined that beautifully in just a few sentences. Would that the Church preached such a message. Last Sunday the associate pastor of a church I attended while traveling, tried to explain that Peter’s vision on Simon the tanner’s roof showed us that we are not to call sin impure because God commands us to eat(accept/embrace) other’s lifestyles. God Bless you and God help us. Hello DocReits, I saw this comment come in and just have to ask what does it mean when you said //that Peter’s vision on Simon the tanner’s roof showed us that we are not to call sin impure because God commands us to eat(accept/embrace) other’s lifestyles.// ? “what does it mean when you said //that Peter’s vision on Simon the tanner’s roof showed us that we are not to call sin impure because God commands us to eat(accept/embrace) other’s lifestyles.// ? I did not say that Pam…the associate pastor said that at the church I attended in Seattle. He was using Peter’s vision(which was to illustrate that the Good News of salvation was available to the Gentiles”) as a proof text that we(the Church) are to accept the gay lifestyle. IOW, calling sin acceptable(clean) in God’s sight. My point is that the Church has the very same problem!! Many(most?) Christian churches rationalize away sin to become more “accepting and acceptable” to our culture and as a result miss out on not only God’s Blessing but perhaps our own salvation. Forsaking sin is at the heart of the Gospel. God saved us in order that we might have fellowship with Him and Glorify His Holy Name forever. The question I raise, “What place has light with darkness?”(2Cor 6:14). Do we(I) sin and will we(I) sin…Yes! But we forsake it, ask forgiveness and go on. This associate pastor, whose church I attended said that we embrace sin by welcoming and attending and participating in events such as the “Gay Christian Convention” he attended. Sad, but a very common occurrence in the watered down Church in America. You have clarified it for me. That pastor apparently forgot to read that 2 Corinthians Chapter 6 (and some other parts of the Bible too) because attending such events are really contrary to what we are called to do “…come out from among them, and be ye separate, saith the Lord, and touch not the unclean thing; and I will receive you,” (a little later in that 2 Cor 6 chapter). I liken this to calling yourself a Christian and choosing to work as a doctor who performs abortion. Or choosing to sit around with the “old buddies” and drink a case of beer to the point of drunkenness. Or spending the night with a prostitute. I could go on … in other words, it is one thing to accept the person who is steeped in such sin and love them anyhow, it is quite another to to condone the sin by participating in the act. Thanks Doc, I do believe we have digressed from the original post. Previous post: Who Was Jethro In The Bible? Next post: What Age Will Everyone Be In Heaven?